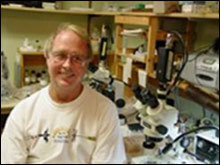 John Janovy Jr., Varner Distinguished Professor of Biological Sciences at the University of Nebraska, will deliver the first lecture in the University of Notre Dame College of Science’s new Innovations and Excellence in Science Teaching series at 7 p.m. Thursday (Nov. 20) in room 105 of the University of Notre Dame’s Jordan Hall of Science. His presentation, which is free and open to the public, is titled"What We Teach, What They Learn, and Why Should Anyone Care." Janovy has pioneered innovative ways of sharing his discipline with undergraduates. During his presentation, he will demonstrate techniques that faculty can use to assist students in developing transferable analytical skills, addressing new technologies, and acquiring communication and interpersonal skills needed for a diverse, global workplace. A prolific author, Janovy has written 14 books, including"Teaching in Eden,""On Becoming a Biologist,""The Keith County Journal,""Outwitting College Professors,"and"Foundations of Parasitology,"a textbook he wrote with Larry Roberts. Janovy has been director of the Cedar Point Biological Station for 13 years and has served as interim director of the University of Nebraska State Museum and as assistant dean of arts and sciences at Nebraska. His research interest is in parasitology with a particular focus on parasite ecology and life cycles. More information on the Janovy lecture, which is sponsored by the College of Science, can be found at www.science.nd.edu/janovy . Originally published by Marissa Runkle and William G. Gilroy at news.nd.edu on November 18, 2008.